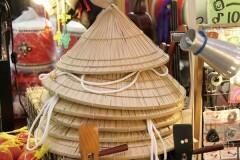 Kubagasa is a traditional Okinawan hat that is made of leaves of livistona plant a.k.a. Chinese Fan Palm. Okinawans call livistona “Kuba” and “gasa” means shade, so Kubagasa literally means shade (hat) made of livistona. Even now, many of Okinawan people who work outdoors, especially farmers and fishermen, wear Kubagasa and they’re still a common sight. Of course, it’s good to protect one’s facial skin from sunshine, and it also keeps your head surprisingly cool. If you get one, please try to use it on a hot day to see yourself.